Natalia Osipova and Ivan Vasiliev, two brilliant Russian ballet stars, have assemble an ad hoc mini-ballet troupe of like-minded dance artists who are unafraid to face the challenges of new work, eschewing the classics that made them famous. Although the three new ballets weren’t all successful—and were a bit overlong—the dancing throughout was superb. Zeitgeist, an American premiere of a work by Alastair Marriott, with movement patterns matching the relentlessly pulsating Philip Glass Violin Concerto No. 1, pitted its lead couple, Ms. Osipova and English ballet star, Edward Watson against a trio of macho men, Marcelino Sambé, Thomas Mock and Donald Thom, all dressed in Jonathan Howells’ chic, leg-and-arm-baring black leotards. Behind them, Luke Halls’ video projections provided a distracting stream of fountain-like, then jagged, light images. The choreography was well within the currently popular international ballet style which includes ferocious non-stop extensions, undulating and slashing arm gestures, stomping and sudden large jumps that match the musical counts but don’t express much beyond their athleticism. The central pas de deux included lots of angular lifts, partnered penchées and pirouettes that never quite established if the two dancers liked each other, let alone were romantic partners. There were lots of grimaces and blank stares as the two entwined. The third and final movement of the Concerto often placed the four men in circle dances around the put-upon Ms. Osipova who piquéd and pirouetted when not being lifted. There was a quick reiteration of the pas de deux and then it was over. This was the only work that was majorly influenced by the classical ballet vocabulary. Mozart & Salieri, the second work and also a premiere, was an absurdist take on the notorious—if mostly fictitious—murderous antipathy of Salieri towards his younger, more talented colleague, Mozart, made famous in the Peter Shaffer play Amadeus. 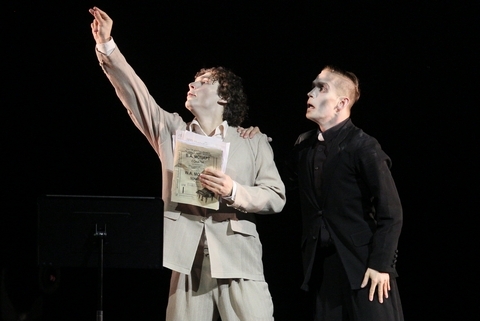 Choreographer Vladimir Varnava, who also played Salieri, turned their relationship into a mime/dance evoking Vladimir and Estragon’s relationship in Beckett’s Waiting for Godot. Mr. Varnava, in a shabby black suit was the simpering, mad Salieri who set about doing in Mr. Vasiliev’s Mozart, attired in a loose-fitting pale suit. They made faces, drank and spit strange green fluids, launched into sudden jumps, rolled around, wrestled and even sang a bit of a Beatles’ song, all to bits and pieces of recorded compositions by Mozart and Salieri sonically bookended by eerie glass harmonica tones. They worked hard and unabashedly, shambling along, often staring at sheet music and sometimes breaking into little happy dances, ending with Mozart either dead or dead-tired, lying motionless on the floor. The final work was Facada, choreographed by Arthur Pita to music composed and mostly played live by Frank Moon. This was the folktale of a bride’s getting even with the groom who abandoned her at the altar, in a style reminiscent of Federico Garcia Lorca blood-revenge plays. Mr. Moon’s music had hints of flamenco, gypsy and Greek folk music. The Lady in Black, Elizabeth McGorian, lithe and smashing in her fashionable black cocktail dress and high heels, menacingly handled a knife which figured into the goings-on later on. This Lady menaced and goaded the Bride. The Bride, Ms. Osipova in a loose, peasant wedding gown, paced nervously as she made final preparations for her wedding ceremony, finally meeting Mr. Vasiliev as the Groom dressed in an ill-fitting suit at the altar. Suddenly he panicked and screamed, running off the stage and up the theater aisle, setting up the murderous rage that pulsated through the rest of this overlong mime dance. Ms. Osipova first wept loudly and collapsed, then stomped about like a deranged animal dragging her long bridal train behind her. The Groom eventually returned and soon they stripped off their outer garments leaving her in a slip and him bare-chested in his boxer shorts. Their love-hate skirmishes, punctuated with little ballet steps, were egged on by the music and by the Lady in Black, ending in a bittersweet stalemate. The packed house cheered the dancers, although there was a sense of languor during some of the drawn out mime sections of the last two ballets. When a program is meant to showcase great dancers, history has proven that they prefer works that show off their self-perceived talents, rarely allowing the eyes of an outside director to challenge their choices. Such was the case here: these two and their little troupe proved they hold nothing back in the acting department while still displaying strong dance technique, but they needed the help of the ballet equivalent of a dramaturg. This splendid revival of the musical based on Mark Twain’s tale has delightful performances, lively staging, and Roger Miller’s sparkling country score.